THE WALKER JUDGE 661100, The Multi-Channel Judge Digital Reference Thermometer. W.L. Walker has provided high accuracy digital temperature devices (PETs) to the measurement world for over 20 years. In 2016, our 90th year of business we announced the availability of our latest Digital offering, The Walker Judge. 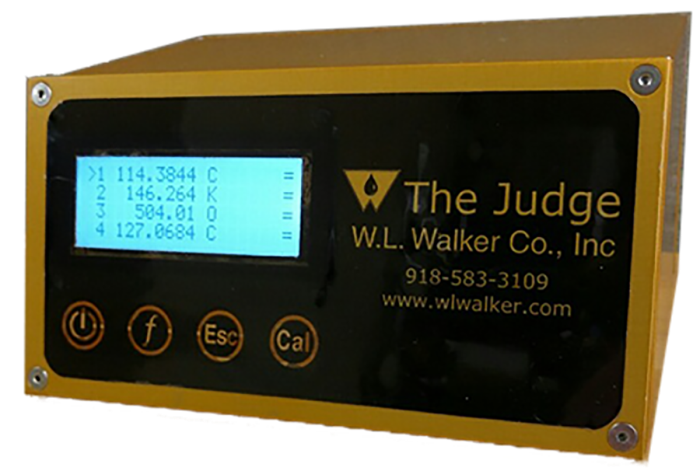 The Walker Judge is a multi channel “reference” digital thermometer, which is as simple to operate as it is intuitive. This unit has been designed in accordance with Chapter 7 Section 2 Third Edition, May 2018. Probe element: 4 wire platinum RTD (1000 ohm). Resolution: 0.00, 0.000, or 0.0000 (user selectable). Display: Alphanumeric LCD, 4 line x 20 character with LED backlight. Host Computer i/f: TTL level UART (3 wire) to USB with supplied cable. Data logging: A date/time stamp, four current, and four average temperature values will be output as comma separated ASCII values via the host computer interface at a user selected interval: 1, 10, 15, or 30 seconds; 1, 10, 15, 30, or 60 minutes. A host computer can request data at any time. Real Time Clock: Year, month, day, hour, minute, second with leap year support. The time is set via the host computer interface.